Created by Bethany Lowe for Bethany Lowe Designs. This is edition is an original creation by Bethany Lowe. B1217 Father Christmas On Antique Sled - 31" x 26" x 35. This elegant Santa is dressed in a long embroidered robe made of vintage velvet and trimmed in mink. He holds a teddy bear and has a tapestry bag of toys on his back. His face and hands are handpainted by Bethany Lowe. He sits on an antique sled. He is a one of a kind piece, signed and numbered by Bethany Lowe. Bethany Lowe is a self-taught artist whose love of antiques and holiday traditions has led her into the world of design. Beth began her career as an artist in 1987 when she created her first Nicholas in "the Nostalgia for Nicholas Collection". Many are based upon folk art legend characters from around the world. However, her most popular designs have been inspired by her own imagination and life experiences. All items are new in mint condition unless stated otherwise above. All items come in their original packaging with all paperwork. We will inspect items to confirm they are mint or upon request. Auctions must be paid with in 7 days of ending or a negative comment will be posted. We do NOT accept "best offers". In many cases, we do list items for sale from our Lombard store, FairyTales, Inc. Credit for the item will not be issued until FairyTales-Inc receives the item in its original condition it was received. 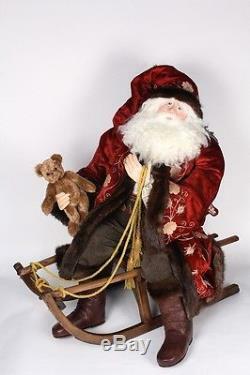 The item "Bethany Lowe Original Christmas Father Christmas On Antique Sled B1217" is in sale since Thursday, March 21, 2013. This item is in the category "Collectibles\Holiday & Seasonal\Christmas\ Current (1991-Now)\Other Current Christmas Décor". The seller is "fairytales-inc" and is located in Lombard, Illinois. This item can be shipped to United States, Canada, United Kingdom, Denmark, Romania, Slovakia, Bulgaria, Czech republic, Finland, Hungary, Latvia, Lithuania, Malta, Estonia, Australia, Greece, Portugal, Cyprus, Slovenia, Japan, China, Sweden, South Korea, Indonesia, Taiwan, South africa, Thailand, Belgium, France, Hong Kong, Ireland, Netherlands, Poland, Spain, Italy, Germany, Austria, Israel, Mexico, New Zealand, Singapore, Switzerland, Norway, Saudi arabia, Ukraine, United arab emirates, Qatar, Kuwait, Bahrain, Croatia, Malaysia, Brazil, Colombia, Panama, Jamaica.